Card Text Each time your opponent plays a creature, gain 1 . 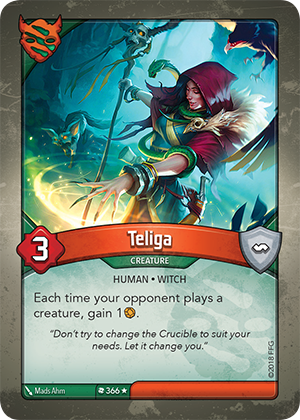 If Teliga is in play, when do I gain the Æmber for my opponent playing a creature? The Æmber is gained when the creature is played, after your opponent gains any printed Æmber bonus under the house symbol, but before any “Play:” abilities are resolved.